So, I truly loved my M-Edge New Yorker Kindle cover (read my review of it here) . But...did you know that The Importance of Being Earnest by Oscar Wilde is my favorite play ever? 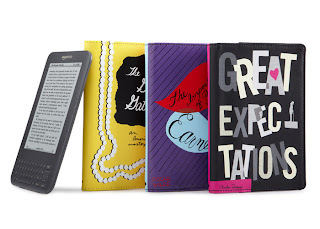 And did you know that Kate Spade makes a Kindle cover that pays tribute to that play ? So really, it was a no-brainer for me. I simply had to have it. The cover is made out of canvas, which is coated on the outside to keep it clean, but uncoated on the inside, which I really like. It's soft and it doesn't collect dirt and dust that could scratch my Kindle like some inner covers do. I've had it for three months and have used it heavily and it hasn't gotten dirty at all. The left side has two pockets, which I find very convenient for stuffing my notecards for my reviews into. This cover keeps the Kindle in place with the hinge system, something I didn't know about prior to purchase. Your Kindle comes with two little slots on the left side that allow for two little "hooks" to latch on to keep it in place. It took me a few minuted to figure out how to get the Kindle in there and get it adjusted just so, but once I figured it out, I loved it! 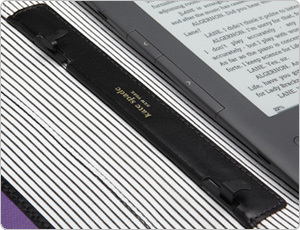 It keeps the Kindle very secure and straight, and it doesn't wiggle around it all. It's relatively easy to get the Kindle back out again, though I did notice that if you do not put your Kindle in correctly, it will be a little crooked and loose. I received a customer service email from Amazon not long after I purchased this cover advising me to not let the Kindle hang solely from the hooks, as it will damage them, which is just a matter of common sense. This cover is slightly thicker than my M-Edge cover and slightly padded, but it provides plenty of security for the Kindle. Unlike other covers, the front flap doesn't fold back all the way, so you have to read the Kindle like you would with a normal book, propped open with two covers. This was a little bit of an adjustment for me, as I really enjoyed reading it with either hand, but certainly not a deal breaker. This one, like my M-Edge cover, doesn't come with a closure, but I haven't had any issues with it falling open in my bag. I've taken it to class and traveled with it, and it's been fantastic. I just put it in my backpack or purse and don't even worry about it. It's very sturdy and protective, but without a utilitarian look. As far as the design goes--I love it! It's simple, cute, and the colors are great. I love the quote on the back from the play and the little details in the corners. It makes such a great statement. The cover came in a sturdy and colorful Kate Spade gift box, which I love as well. The full price was a little much for me, but I snatched it up when it went on sale. This cover also comes in two other designs featuring the classics The Great Gatsby and Great Expectations. I might be tempted to buy the Great Gatsby one next if I have a little extra money! I have the "Great Expectations" design, and I love it! It is beautiful, and I've had it for almost 6 months and everything is still in pristine condition. I highly recommend these! Wow! Those re really cool. I just have the plain old black cover, but I think I need to trade up. Those are so cute! I don't like my boring cover but haven't gotten around to getting a new one yet -- pure laziness! I have a kate spade cover too, and love it. Mine is pink and says "she kept her nose in a book and her head in the clouds" so cute! love the new covers. These are so cute- maybe I'll have to trade up. hmmm. . .so many choices. . . I love the Kate Spade cover. They look so pretty. 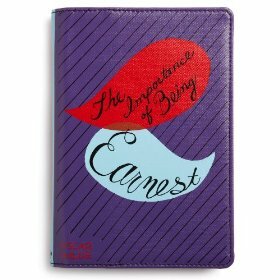 I'm making my own cover for the Kindle, but if I had to buy one it would definitely be a Kate Spade. I love The Importance of being Earnest, as well.